For one Hodgenville woman sewing has been such a big part of her life that she made a business from it. Rosa Smith started learning to sew at a very young age, “My mother was a seamstress and I remember her making costumes for my uncle who was a mariachi performer. I would have to be her manikin and hold up the coat while she sewed the embellishments on it.” Smith said. 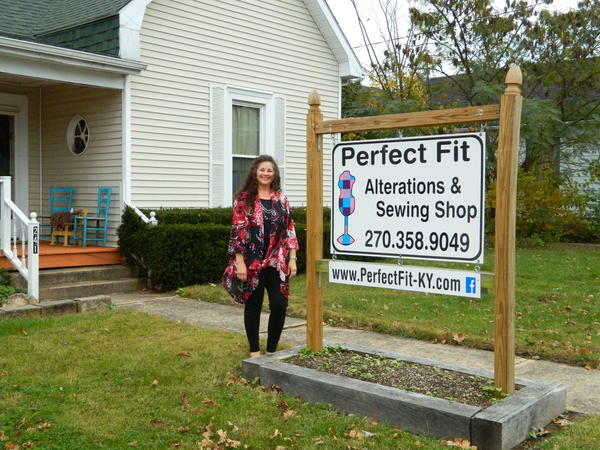 Rosa Smith owner of Perfect Fit Alterations and Sewing Shop located at 241 South Greensburg Street in Hodgenville. Smith is also a certified master sewing volunteer with the LaRue County Extension Service and volunteers teaching sewing and alteration classes. Perfect Fit offers alterations on women’s and children’s clothing, pageant, prom and bridal. Smith also designs custom gowns and can reconstruct gowns to a clients specifications as well as redesigning heirloom dresses. Smith also offers private sewing lessons for all levels of experience. You can reach Perfect Fit by phone at 270-358-9049, Facebook at www.facebook.com/pfsewing or visit their website at www.perfectfit-ky.com.